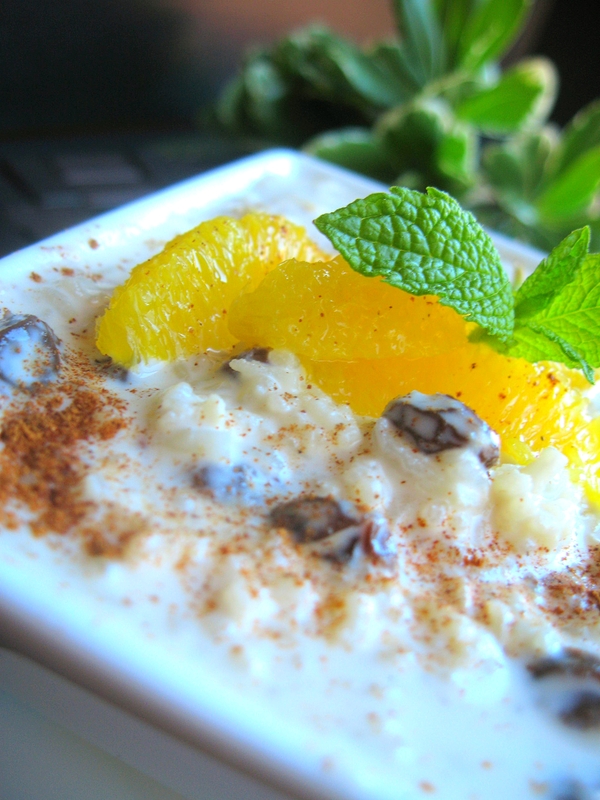 Rice pudding is one of my all time favorite desserts. It is so comforting. Something about the texture, and for me, the addition of cinnamon that is just magical. It brings me right back to when I was a child. Granted my mother never made it herself, but when she would bring it home from the grocery store it would a special treat. I would take small bites, roll the pudding around on my tongue, and savor every last little bit. Luckily making rice pudding at home is extremely easy, and, since I found myself with a bowl of leftover basmati rice from last night’s dinner, this morning I knew exactly what to do. 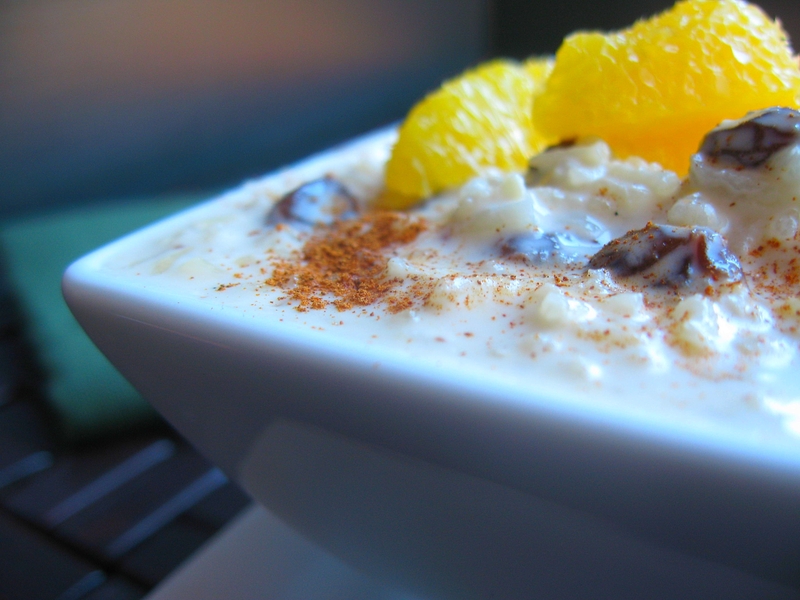 (This recipe is a variation of Ina Garten’s , delicious Rum Raisin Rice Pudding, which I have made for years, with a few of my own extra touches thrown in.) I took two heaping cups of cooked rice, and simmered it in four cups of half ‘n half (Hey. I didn’t say you should make this every day. Get off my back! ), to which I added a big pinch of salt, about a half of a cup of sugar, one vanilla bean, and one cinnamon stick. Let it simmer away for about thirty minutes, stirring frequently, until most of the liquid is absorbed, and the rice is very tender. Meanwhile, I took a handful of raisins and soaked them in a healthy splash of dark rum, along with a couple of teaspoons of vanilla extract, and a little freshly grated orange zest. When the rice is done, add one beaten egg, another cup of half ‘n half, and the raisin mixture. Give it a couple more minutes on the stove, then pour it into a bowl, and chill it (to prevent a skin from forming you will want to place plastic wrap directly on the top). I like to serve this pudding with a few orange segments, and an extra little sprinkling of ground cinnamon. This pudding is rich, creamy, and sweet. The interplay of cinnamon, orange, rum, and vanilla along with the texture of the rice and raisins, makes this humble pudding feel extravagant. Whether cold in the summer, or warm in the winter, I can’t imagine any of your guests will turn down this luxurious treat. Enjoy! You’ve combined some of my favorite things into one amazing looking dessert. 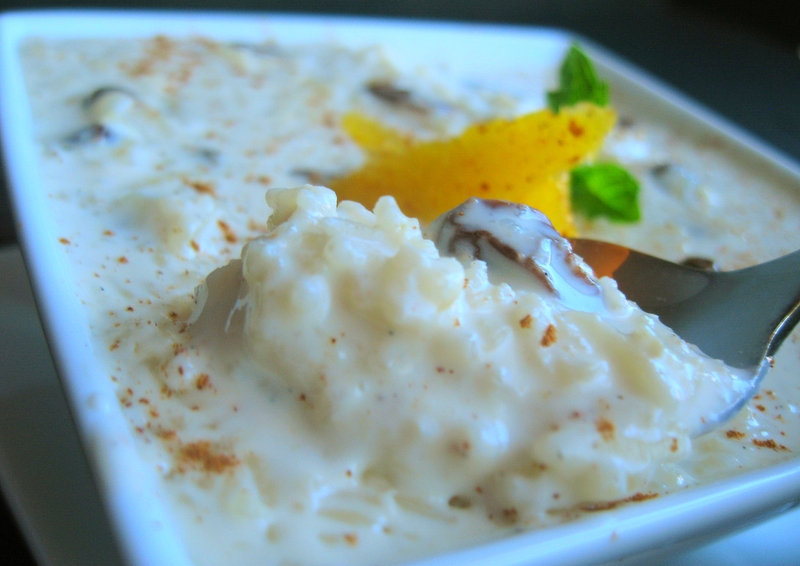 Ever since I was a child, I’ve loved rice pudding. The best, in my opinion, is when you eat it warm on a cold night. A bowl of that and I’m ready for bed. The addition of rum is fantastic! Take my childhood favorite and give it an adult twist… I like it! This looks delicious Jacob…rice pudding is a favorite at our house. Yumm so good! I love your blog. You always make such good stuff! OMG JACOB’S KITCHEN…THIS IS THE BEST ONE YET!!!!CONGRATS. AND THANK YOU SO MUCH FOR THE TIPS ON ORANGE SECTIONS AND CINNAMON STICK..